A cladogram is a diagram that shows evolutionary relationships of several clades. A clade is a group of organisms, which contains both an ancestral species and its descendants. 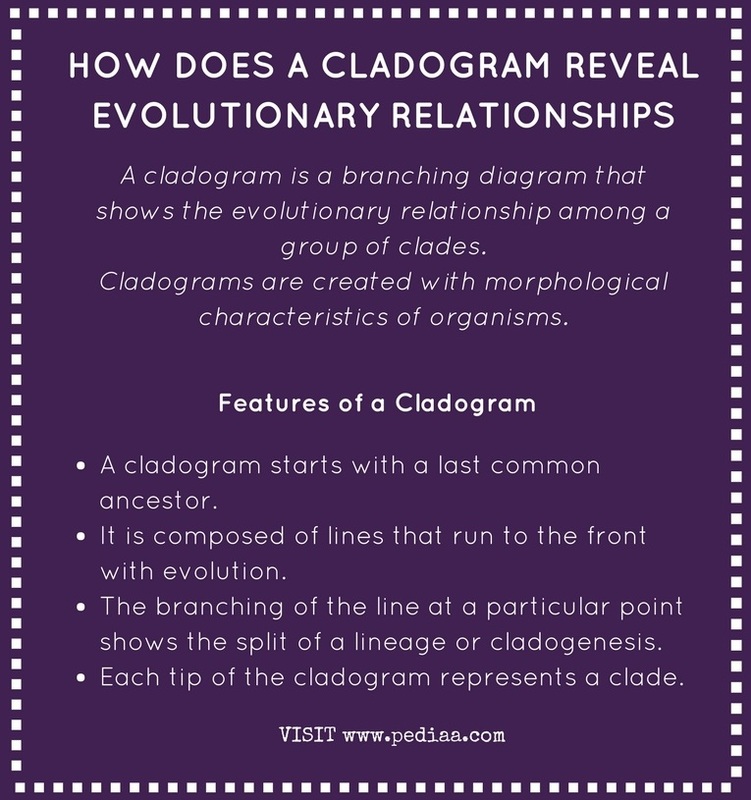 Hence, each branch of a cladogram ends with a new clade. The common ancestor appears at the root of the cladogram. Each root of the branching point shows an ancestral species. However, a cladogram does not depict the number of evolutionary changes or evolutionary time. The information that can be obtained from a cladogram is described in this article. A cladogram is a branching diagram that shows the evolutionary relationship among a group of clades. Morphological characteristics of organisms are mainly used in the generation of a cladogram. However, a cladogram does not reveal the genetic distance or evolutionary time of organisms as in a phylogenetic tree. Morphological characteristics are the factors involved in the generation of a cladogram. Features of a cladogram that help in revealing the evolutionary relationships of closely-related organisms are described below. A cladogram starts with a last common ancestor. It is composed of lines, which run to the front with evolution. The length of the lines does not represent the evolutionary time. The branching of the line at a particular point shows the split of a lineage or cladogenesis. Each tip of the cladogram represents a clade. A cladogram of insects is shown in figure 1. The first insects that branched off from the common ancestor are beetles. Then, wasps, bees, and ants are branched off. Thirdly, butterflies and moths are branched off. Finally, flies are branched off from butterflies and moths. A cladogram is a diagram that shows evolutionary relationships among closely-related organisms. It is generated based on the morphological characteristics of a group of closely-related organisms. These organisms are classified into clades, which descend from a last common ancestor. A cladogram shows the descending of the closely-related clades from the last common ancestor. 1. Wilkin, Douglas, and Niamh Gray-Wilson. “Phylogeny and Cladistics.” CK-12 Foundation, 16 June 2017, Available here.